The progenitor cells of the developing liver can differentiate toward both hepatocyte and biliary cell fates. In addition to the established roles of TGFβ and Notch signaling in this fate specification process, there is increasing evidence that liver progenitors are sensitive to mechanical cues. Here, we utilized microarrayed patterns to provide a controlled biochemical and biomechanical microenvironment for mouse liver progenitor cell differentiation. In these defined circular geometries, we observed biliary differentiation at the periphery and hepatocytic differentiation in the center. Parallel measurements obtained by traction force microscopy showed substantial stresses at the periphery, coincident with maximal biliary differentiation. We investigated the impact of downstream signaling, showing that peripheral biliary differentiation is dependent not only on Notch and TGFβ but also E-cadherin, myosin-mediated cell contractility, and ERK. We have therefore identified distinct combinations of microenvironmental cues which guide fate specification of mouse liver progenitors toward both hepatocyte and biliary fates. Children are said to be a product of both nature and nurture – of their genes and the environment in which they are raised. The cells of the growing liver are not so different in this sense. As the liver of a fetus develops, immature cells called liver progenitors mature to become one of two types of adult cells: the hepatocytes that form the bulk of the liver, or the biliary cells that make up the bile duct. The traditional view is that genetic factors mainly control which cell type the progenitor cells become. However, recent research suggests that the environment around the cells matters more in this process than once thought. Cells can respond to the physical properties of their environment, such as the structure and stiffness of the surrounding tissue. These properties change as the liver develops, and can also be altered by disease. For example, damaged liver cells can spit out proteins that harden and form stiff scars. This raises a question: do changes in stiffness affect how progenitor cells behave? To answer this question, Kaylan et al. printed collagen in circular patterns and grew liver progenitor cells on them. The cells at the edges of the circular patterns matured into bile duct cells, while those in the center became hepatocytes. The stiffness felt by the cells was then determined by measuring the level of mechanical stress that they experienced. This revealed that the cells at the edge of the collagen pattern – the cells that became bile duct cells – were under most stress. In addition, more bile duct cells formed when progenitor cells were grown on a stiffer collagen pattern. Overall, the results reported by Kaylan et al. suggest that the stiffness of the environment, and the resulting stresses on a progenitor cell, can influence how it matures. As well as helping us to understand how the liver develops, this knowledge could also help us to treat a group of diseases called cholangiopathies, in which the bile ducts become inflamed. These diseases are thought to be caused by certain cells (which are similar to liver progenitor cells) maturing to become incorrect cell types. Future studies could determine if preventing changes in stiffness in the environment of these cells, or slowing their response to such changes, would help patients. The cells which populate the hepatic diverticulum during development and later serve as the source of liver parenchyma are termed bipotential progenitor cells, or hepatoblasts, as they are capable of differentiating toward both hepatocytic and biliary epithelial cell fates. While differentiation of liver progenitors toward a hepatocytic fate is guided chiefly by signaling through Wnt, HGF, and FGF (Micsenyi et al., 2004; Berg et al., 2007; Schmidt et al., 1995), biliary fate is regulated by Notch and TGFβ signaling (Kodama et al., 2004; Clotman et al., 2005; Zong et al., 2009). Specifically, a gradient of TGFβ activity caused in part by expression of TGFβR2 and TGFβR3 in the periportal region leads to differentiation of progenitors toward a biliary epithelial fate (Clotman et al., 2005). In patients with Alagille syndrome, mutations in the ligand JAG1 or receptor NOTCH2 are associated with bile duct paucity and cholestasis (Li et al., 1997; Oda et al., 1997; McDaniell et al., 2006). Zong et al. further underlined the importance of Notch in particular for both biliary cell fate and morphogenesis by showing that deletion of the Notch effector Rbpj results in reduction of both biliary fate and abnormal tubulogenesis (Zong et al., 2009). Thus, the progenitor cells of the developing liver integrate a diverse set of biochemical cues during fate specification. Several recent lines of evidence suggest, however, that liver progenitor cells are influenced not only by biochemical cues but also biophysical parameters in their microenvironment. Using combinatorial extracellular matrix (ECM) protein arrays, we showed that TGFβ-induced biliary differentiation of liver progenitor cells is coordinated by both substrate stiffness and matrix context and is further correlated with cell contractility (Kourouklis et al., 2016). Several groups have established mechanosensing via the transcriptional co-activator YAP and further elaborated a novel role for this protein in the developing cells of the liver (Camargo et al., 2007; Dupont et al., 2011; Yimlamai et al., 2014; Lee et al., 2016). This is particularly interesting in the context of liver progenitor fate specification because YAP has been shown to regulate both Notch signaling and TGFβ in liver cells (Yimlamai et al., 2014; Lee et al., 2016). However, the potential link between mechanical sensing and the fate specification of liver progenitor cells has yet to be fully defined. Here, we utilize microarrayed patterns of ECM co-printed with Notch ligands to provide a controlled biochemical and biomechanical environment for liver progenitor cell differentiation. We characterize spatially-localized, segregated differentiation of these progenitor cells toward biliary fates at the periphery of patterns and hepatocytic fates near the center of patterns. We employ traction force microscopy (TFM) to measure cell-generated forces, observing high stresses coincident with peripheral biliary differentiation. Further, we explore the dependence of peripheral biliary differentiation of progenitors on mechanotransduction pathway activity and expression of the Notch ligands Jag1 and Dll1. Collectively, our findings provide support for a model of liver progenitor differentiation which includes mechanical signaling as a key regulator of spatially-segregated progenitor differentiation and downstream biliary morphogenesis. We have previously observed peripheral expression of the biliary marker osteopontin (OPN) in liver progenitors on arrayed patterns containing both ECM proteins and Notch ligands (Kaylan et al., 2016). In order to better characterize the expression profile of cells in the periphery vs. center, we fabricated arrays of circular patterns (∼600 μm diameter) containing the ECM protein collagen I paired with either control IgG or Fc-recombinant Notch ligands (DLL1, DLL4, and JAG1). These ligands were pre-conjugated to Protein A/G so as to increase ligand functionality by clustering and orientation. Bipotential mouse embryonic liver (BMEL) progenitor cells, which are capable of assuming a hepatocytic or biliary fate (Strick-Marchand and Weiss, 2002), were seeded on these Notch ligand arrays and cultured under differentiation conditions for t=72h, at which point we immunolabeled for OPN and the hepatocytic marker albumin (ALB). Within these defined multicellular geometries, we observed OPN+ cells at the periphery of patterns while ALB+ cells were located centrally (Figure 1A). Counts of cells that were OPN+ peaked at the periphery and increased with the presentation of Notch ligands, particularly DLL4 (Figure 1B). However, counts of cells that were ALB+ cells indicated central localization and only moderate induction by ligand in the center of patterns (Figure 1C). Multiple regression analysis of these data generated coefficient estimates (β) for each presented ligand, corresponding to the mean change in cell counts from control IgG (Figure 1E and Figure 1F). These coefficient estimates confirmed increases in both peripheral OPN+(β=37.5, P<0.001) and central ALB+ (β=5.64, P<0.001) cell counts upon presentation with DLL4. Evaluation of the expression of the biliary transcription factor SOX9 and hepatocytic transcription factor HNF4A revealed segregation similar to that of OPN and ALB (Figure 1D). Specifically, SOX9-expressing cells were at the periphery while HNF4A-expressing cells were central. We also evaluated expression of the biliary marker cytokeratin 19 (CK19) (Figure 1—figure supplement 1) and observed 1.6 times greater intensity in cells at the periphery compared to those in the center (P<0.001) (Figure 1—figure supplement 1). We observed peripheral expression of both OPN and CK19 at t=24h, suggesting that segregation starts earlier than t=72h and is less likely to be dependent on cell motility mechanisms (Figure 1—figure supplement 2A). Measurements of cell density across the island at t=72h indicated uniform density with radius, ruling out cell condensation as a mechanism of differentiation (Figure 1—figure supplement 2B). In preliminary experiments, we determined that patterns of approximately 600 µm diameter would lead to consistent patterned differentiation. Accordingly, for most our studies here, 600 µm diameter patterns were utilized. However, to examine potential effects of pattern diameter, we generated complementary array sets that resulted in cellular island diameters of 300 µm and 1000 µm, in addition to 600 µm (Figure 1—figure supplement 3A). Quantification of peak OPN+ cell counts on these pattern sizes indicated that biliary differentiation remained confined to the periphery independent of pattern size (Figure 1—figure supplement 3B). Together, these data establish spatially-segregated liver progenitor fates in arrayed patterns with central hepatocytic differentiation and peripheral biliary differentiation. Localized differentiation of liver progenitors in arrayed patterns. (A) Immunolabeling of BMEL cells for the biliary marker OPN and hepatocyte marker ALB on arrayed collagen I patterns with control IgG or Fc-recombinant Notch ligands DLL1, DLL4, and JAG1. (B) Quantification of OPN+ cell counts as a function of radial distance from the centroid of each island. (C) Quantification of ALB+ cell counts as a function of radial distance from the centroid of each island. (D) Immunolabeling of BMEL cells presented with DLL4 for the biliary transcription factor SOX9 and hepatocyte transcription factor HNF4A. Arrow in each image indicates the same SOX9+/HNF4A− cell. Scale bar indicates 75 µm. (E, F) Regression analysis of OPN+ and ALB+ cell counts. Data in Figure 1B and Figure 1C were separated into peripheral and central subsets for which dimensionless radius was greater than 0.75 (R>0.75) and less than 0.75 (R<0.75). Separate multiple regression models were generated for each data subset for which coefficient estimates (corresponding to mean change in cell counts) and 95% CI were plotted for OPN+ (E) and ALB+ (F) cells. For each factor, 95% CI that do not intersect with the dashed line indicate regression coefficient estimates for which P<0.05. (A, E) Scale bars indicate 150 µm. We next asked if Notch signaling is necessary for peripheral biliary differentiation in arrayed patterns. We treated cultures with an inhibitor of Notch signaling (γ-secretase inhibitor X, GSI) and observed reduction in OPN+ cell counts at the periphery (Figure 2A and B). Prompted by previous experiments which showed that liver progenitor differentiation is sensitive to substrate stiffness (Kourouklis et al., 2016), we also evaluated progenitor differentiation on soft (4 kPa) rather than stiff (30 kPa) substrates, observing decreased counts of peripheral OPN+ cells and similar responsiveness to GSI (Figure 2A and B, Figure 2—figure supplement 1). Multiple regression analysis of these data confirmed reduction in peripheral OPN+ with both GSI treatment (β=-9.99, P<0.001) and culture on 4 kPA substrates (β=-3.10, P=0.00292) (Figure 2—figure supplement 2). ALB+ cell counts increased with GSI treatment (β=5.41, P<0.001), suggesting that hepatocytic differentiation is inhibited by active Notch signaling (Figure 2—figure supplement 3 and Figure 2—figure supplement 2). We also evaluated expression of SOX9 and HNF4A, observing reduction in peripheral SOX9 expression and an increase in central HNF4A expression on soft substrates compared to stiff (Figure 2C). Quantification of immunolabel intensity for SOX9 and HNF4A on both soft and stiff substrates confirmed our qualitative observations (Figure 2D), indicating a 74.7% increase in overall SOX9 intensity on 30 kPa substrates (relative to 4 kPa substrates, P<0.001) and 40.6% increase in overall HNF4A intensity on 4 kPa substrates (relative to 30 kPa substrates, P<0.001). Using in situ hybridization of mRNA, we characterized the expression of Notch family members in arrayed patterns of liver progenitors. To do so, we validated several probes against Jag1, Dll1, and Notch2 (data not shown). 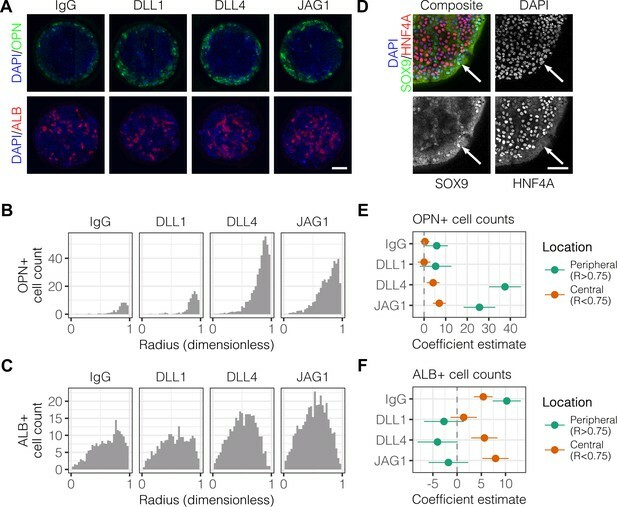 When used to detect mRNA in arrayed patterns fabricated on stiff (30 kPa) substrates, we observed peripheral localization of Jag1, Dll1, and Notch2 (Figure 2E). Presentation of the ligand DLL4 induced rearrangement of this expression pattern, specifically causing an increase in centrally-located cells expressing mRNA for each gene. On soft (4 kPa) substrates, we observed similar mRNA expression for cells presented with IgG but no longer observed ligand-induced central expression for Jag1 and Notch2. This loss of ligand-induced central expression on soft substrates suggests that the responsiveness of liver progenitors to Notch ligand is enhanced by stiffer substrates. Collectively, these data show that segregation of liver progenitor fates is dependent on both Notch signaling and substrate stiffness. Peripheral biliary differentiation is dependent on both Notch signaling and substrate stiffness. (A) Immunolabeling for OPN of BMEL cells presented with DLL4 on 30 kPa and 4 kPa substrates. Cells were treated with vehicle control (DMSO) or an inhibitor of Notch signaling (γ-secretase inhibitor X, GSI, 5 µM). (B) Quantification of OPN+ cell counts on 30 kPa and 4 kPa substrates after treatment with DMSO or GSI. (C) Immunolabeling for SOX9 and HNF4A of BMEL cells on 30 kPa and 4 kPa substrates. (D) Quantification of SOX9 and HNF4A intensity on 30 kPa and 4 kPa substrates. (E) RNA in situ hybridization for Jag1, Dll1, and Notch2 on 30 kPa and 4 kPa substrates. Cells were exogenously presented with IgG or DLL4. (A, C, E) Scale bars indicate 150 µm. (B, D) Mean ± 95% CI. Previous studies have delineated a role for TGFβ in liver progenitor differentiation (Clotman et al., 2005), and we have described interactions between TGFβ and Notch signaling in this context (Kaylan et al., 2016). To determine if TGFβ is involved in the generation of biliary cells at the periphery of the arrayed patterns, we treated cells with an inhibitor of TGFβ type I receptor kinase signaling (SB-431542) or stimulated with exogenous TGFβ1 (Figure 3A). Treatment with SB-431542 reduced the peripheral count of OPN+ cells while increasing central expression of HNF4A (Figure 3A, Figure 3—figure supplement 1). In contrast, treatment with TGFβ1 increased counts of OPN+ cells uniformly across the patterns irrespective of ligand presented (Figure 3A and B), in agreement with previous efforts showing uniform induction of OPN on patterns of smaller diameter (150 µm) (Kourouklis et al., 2016). Similarly, in situ hybridization for Jag1, Dll1, and Notch2 mRNA showed uniform induction across the patterns with TGFβ1 treatment (Figure 3—figure supplement 2). Interestingly, we observed loss of cell–cell junctional interactions in cells treated with TGFβ1, which is thought to be a consequence of inhibition of E-cadherin expression by the Snail family of transcription factors (Cano et al., 2000; Vincent et al., 2009). To ascertain the impact of E-cadherin function without activation of the other regulatory programs of TGFβ, we treated cells with a functional antibody against E-cadherin (DECMA) (Figure 3A). In contrast with our observations following treatment with TGFβ1, we observed differential responsiveness to control IgG and DLL4 presentation (Figure 3B). Specifically, presentation of DLL4 to cells treated with DECMA resulted in uniform induction of OPN+ cells across the patterns. We confirmed this observation using the Kolmogorov–Smirnov test, which showed that the difference between the IgG and DLL4 probability density distributions (measured by D, the supremum distance) was greater for DECMA (D=0.437, P<0.001) compared to both DMSO (D=0.0655, P<0.001) and TGFβ1 (D=0.0848, P=0.0350). Last, although inhibition of TGFβ by treatment with SB-431542 reduced OPN+ cell counts, mRNA in situ hybridization of cultures treated with SB-431542 indicated that both Jag1 and Notch2 remain expressed at the periphery (Figure 3C). However, SB-4315412 treatment reduced expression of both Jag1 and Notch2 in centrally-located cells presented with DLL4 (Figure 3C), which we had previously observed in untreated cultures (Figure 2E). These data therefore demonstrate that TGFβ only partially regulates fate segregation and that these effects are additionally mediated by cell–cell junctional interactions through E-cadherin. TGFβ signaling and cell–cell interaction strength modulate pattern formation. (A) Immunolabeling for OPN and HNF4A of BMEL cells presented with IgG and DLL4 on 30 kPa substrates. Cultures were treated with vehicle control (DMSO), inhibitor of TGFβ signaling (SB-431542, 10 µm), TGFβ1 (1.5 ng/ml), or functional anti-E-cadherin (DECMA, 10 µg/ml). (B) Quantification of OPN+ cell probability density distributions after treatment with DMSO, TGFβ1, or DECMA. (C) RNA in situ hybridization for Jag1 and Notch2 of cells exogenously presented with IgG or DLL4 and treated with DMSO or SB-431542. (A, C) Scale bars indicate 150 µm. Others have established a role for mechanical stresses in multicellular pattern formation and stem cell differentiation, specifically observing collection of mechanical stresses at the corners and edges of geometric shapes (Nelson et al., 2005; Ruiz and Chen, 2008; Kilian et al., 2010; Ma et al., 2015). Having previously demonstrated a combinatorial role for biochemical and biomechanical stimuli in liver progenitor cell fate (Kourouklis et al., 2016), we hypothesized that mechanical stress gradients are involved in the segregation of liver progenitor fates arrayed patterns. To obtain theoretical predictions of mechanical stress, we used finite element modeling (FEM) of an active layer (i.e., the cell monolayer) of 600 µm diameter bound to a passive substrate with fixed lower boundary (Figure 4A). 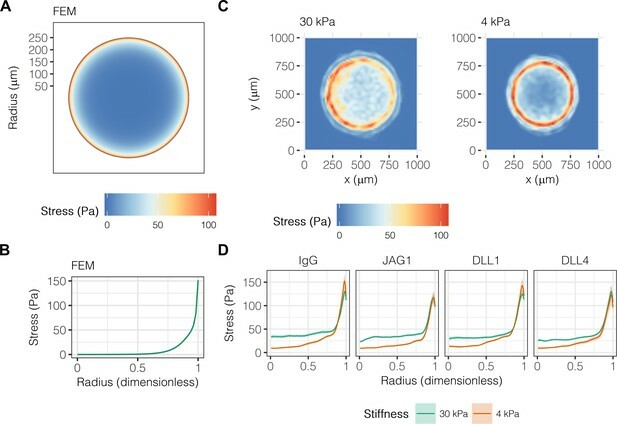 We observed peak stresses of 150 Pa at the periphery of the active layer (Figure 4B), in agreement with previous simulations (Nelson et al., 2005). Next, we used TFM to obtain experimental measurements in liver progenitor cells, observing that traction stresses are collected at the periphery of patterns on both 30 kPa and 4 kPa substrates (Figure 4C). The peak magnitude and distribution of stresses across the patterns did not vary with ligand presentation (Figure 4D). However, we did observe that central cells (R<0.75) on 30 kPa substrates exerted stresses averaging to 32.9 Pa, which was statistically greater than the 16.2 Pa of stress exerted by cells on 4 kPa substrates (P<0.001). TFM measurements of cells treated with GSI showed that Notch signaling was not upstream of traction stress generation at the periphery (Figure 4—figure supplement 1). In contrast, inhibition of TGFβ by treatment with SB-431542 resulted in more uniform traction stress distributions in cells presented with both IgG and DLL4 (Figure 4—figure supplement 2). Intriguingly, treatment with functional antibody against E-cadherin (DECMA) resulted in more uniform traction stress distribution in cells presented with IgG but not DLL4, indicating that ligand presentation in the context of reduced cell–cell interactions induces cell-generated traction stresses. In sum, these data show that mechanical stresses are collected at the periphery, coincident with peripheral biliary fate, and are further dependent on TGFβ signaling and E-cadherin interactions between cells. Liver progenitors in arrayed patterns generate gradients of traction stress independent of ligand presentation. (A) Simulated finite element modeling (FEM) stress profile of arrayed patterns. (B) Stress from FEM as a function of radius. (C) Experimental stress profiles obtained by traction force microscopy (TFM) of BMEL cells on 30 kPa and 4 kPa substrates presented with DLL4. (D) Stress from TFM as a function of radius, substrate stiffness (30 kPa and 4 kPa), and ligand (IgG, JAG1, DLL1, DLL4). Mean ± 95% CI. Having established the presence of gradients of mechanical stress in patterns, we next hypothesized that these gradients are involved in the segregated differentiation of liver progenitors. In order to first determine whether regulation by this gradient of mechanical stress is consistent with known modes of Notch signaling, we used a lattice-based computational model described by the groups of Elowitz and Sprinzak (Sprinzak et al., 2010; Formosa-Jordan and Sprinzak, 2014). We adapted their computational model to include: (1) fixed boundary conditions to better represent the physical boundary of our arrayed patterns; and (2) an additional term representing the effect of the stress gradient on expression of both Notch receptor and ligand, as observed in our mRNA in situ hybridization experiments. A model of trans-activation (Kt=10 and Kc=0) with increasing stress gradient strength (b=0,0.5,5) produced segregation of fates qualitatively similar to our experimental results (Figure 5A). Concentration profiles of Notch receptor and repressor, a measure of Notch signaling activity, in models including trans-activation and steeper stress gradients were also qualitatively consistent with our experimental data (Figure 5B). Notably, simulations without stress suggested a biphasic distribution of receptor, which we did not observe experimentally. As experimental validation, we treated cells with blebbistatin (Figure 5C), an inhibitor of myosin II ATPases, and observed reduced peripheral OPN+ cell percentages (Figure 5D). These observations are in agreement with our previous experiments (Kourouklis et al., 2016), indicating that myosin-mediated contractility is necessary for peripheral biliary differentiation. TFM measurements obtained in parallel indicated loss of peripheral traction stresses in cells treated with blebbistatin (Figure 5D), in agreement with the known action of this inhibitor. These simulations demonstrate that a simple model of Notch trans-activation coupled with an external stress gradient is consistent with our experimental findings. Peripheral differentiation is dependent on a gradient of actomyosin contractility. (A) Simulated effect of stress gradients of increasing steepness on Notch signaling activity via trans-activation. Darker shades of blue represent increased Notch signaling activity as measured by repressor levels. (B) Quantification of simulated Notch receptor and cleavage events generating repressor, a measure of Notch signaling activity, under conditions of no (b=0) and high (b=5) stress gradients. Concentration is in arbitrary units normalized to the periphery for each condition. (C) BMEL cells on 30 kPa substrates were presented with DLL4 and treated with vehicle control (DMSO) and inhibitor of myosin II ATPases (blebbistatin, 25 µM). Samples were immunolabeled for OPN and HNF4A. Scale bar is 150 µm. (D) Quantification of OPN+ cell percentages and stress from TFM after treatment with DMSO and blebbistatin. Gray lines and associated ribbons represent the DMSO control replotted in additional panels to aid comparison. Mean ± 95% CI. In order to ascertain which specific mechanotransduction pathways are involved in this process, we treated cells with inhibitors for ERK (FR180204) and ROCK (Y-27632) (Figure 6A). We observed that FR180204 reduced OPN+ cell percentages at the outer edge of the patterned domains (Figure 6B), which is in accordance with our previous studies suggesting involvement of ERK in biliary differentiation (Kourouklis et al., 2016). In contrast, inhibition of ROCK resulted in increased peripheral OPN+ cell percentages extending centrally (Figure 6A and B). Consistent with the respective functions of the proteins targeted by these inhibitors, TFM measurements indicated loss of peripheral traction stresses in cells treated with Y-27632 but not FR180204 (Figure 6C). Analysis of Jag1 and Notch2 mRNA expression in cells treated with FR180204 indicated that inhibition of ERK signaling results in direct reduction in expression of both ligand and receptor (Figure 6D). Furthermore, we observed that the Hippo pathway effector YAP exhibited increased expression at the periphery of arrayed patterns on both 30 kPa and 4 kPa substrates (Figure 6E), though the expression of YAP was not altered by the presence of Notch ligands in the arrayed domains (data not shown). This observation of peripheral YAP expression is especially interesting in light of recent findings regarding the demonstrated role of YAP in biliary fate (Yimlamai et al., 2014) and suggests a potential role for the Hippo pathway in progenitor fate segregation. Collectively, these data show that peripheral biliary differentiation is dependent on myosin-mediated cell contractility and ERK signaling and is decoupled from mechanical stress when ROCK is inhibited. Mechanotransduction by ERK and ROCK modulate peripheral biliary fate. (A) BMEL cells on 30 kPa substrates were presented with DLL4 and treated with vehicle control (DMSO) and inhibitors of ERK signaling (FR180204, 10 µM) and ROCK (Y-27632, 10 µM). Samples were immunolabeled for OPN and HNF4A. (B) Quantification of OPN+ cell percentages after treatment with DMSO, FR180204, or Y-27632. (C) Stress from TFM after treatment with DMSO, FR180204, or Y-27632. (D) RNA in situ hybridization for Jag1 and Notch2 of cells exogenously presented with DLL4 and treated with DMSO or FR180204. (E) Immunolabeling for YAP of BMEL cells presented with DLL4 on 30 kPa substrates. Quantification shows YAP intensity (a.u.) of cells presented with DLL4 on 30 kPa (green) and 4 kPa (orange) substrates by dimensionless radius. Mean ± 95% CI. (A, D, E) Scale bars are 150 µm. (B, C) Gray lines and associated ribbons represent the DMSO control replotted in additional panels to aid comparison. Mean ± 95% CI. Studies of Alagille syndrome, a genetic disorder which results in bile duct paucity, have shown that the Notch ligand JAG1 is necessary for bile duct formation (Li et al., 1997; Oda et al., 1997). Our previous work has also shown that the Notch ligand Dll1 can modulate differentiation toward both biliary and hepatocytic fates (Kaylan et al., 2016). We therefore hypothesized that the Notch ligands Jag1 and Dll1 are involved in the segregation of liver progenitor fates in arrayed patterns. Using lentiviral shRNA vectors, we knocked down Jag1 (shJag1) and Dll1 (shDll1) in liver progenitors and cultured them on arrayed patterns (Figure 7A and B). 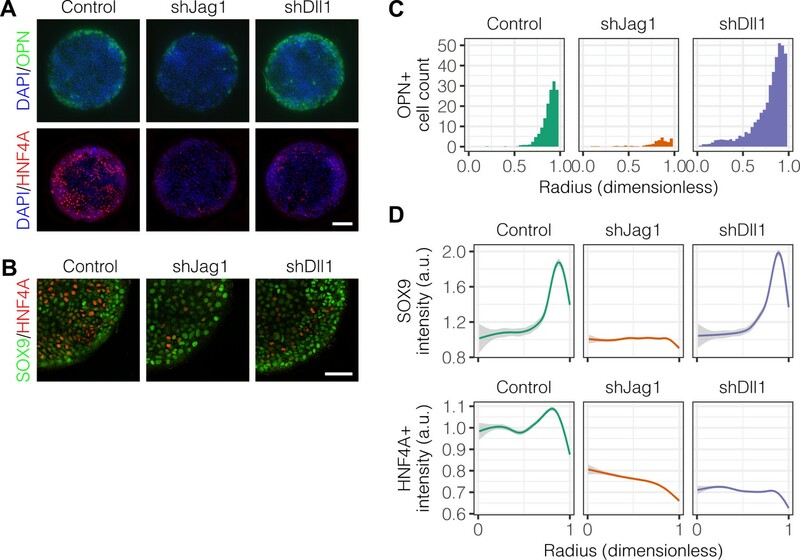 We observed that shJag1 cells exhibited reduced OPN+ cell counts at the periphery (β=-16.3, P<0.001) while, in contrast, counts of peripheral shDll1 cells that were OPN+ increased (β=20.1, P<0.001), observations confirmed by quantification (Figure 7C) and regression analysis (Figure 7—figure supplement 1). In agreement with the data for OPN, only shJag1 cells exhibited loss of peripheral SOX9 expression (Figure 7D). Interestingly, knockdown of both Jag1 and Dll1 resulted in decreased central HNF4A expression (Figure 7B and D). TFM of shJag1 and shDll1 cells showed no reduction in cell-generated traction stresses by ligand knockdown compared to control cells (data not shown). These data establish contrasting roles for Jag1 and Dll1 in biliary differentiation in which Dll1 has the unanticipated function of antagonizing biliary fate and, further, suggest that the ligands are involved in hepatocytic differentiation of progenitor cells. Notch ligands Jag1 and Dll1 are both required for segregation of hepatocytic fate centrally and biliary fate peripherally. (A) Immunolabeling for OPN and HNF4A of BMEL cells presented with DLL4 on 30 kPa substrates. Control cells were transduced with an shRNA vector coding for a non-mammalian target. shJag1 and shDll1 cells were transduced with shRNA vectors targeting Jag1 and Dll1, respectively. Scale bar is 150 µm. (B) Confocal imaging of immunolabeled SOX9 and HNF4A in control, shJag1, and shDll1 cells presented with DLL4 on 30 kPa substrates. Scale bar is 75 µm. (C) Quantification of OPN+ cell counts of control, shJag1, and shDll1 cells presented with DLL4 on 30 kPa substrates. (D) Quantification of SOX9 and HNF4A intensity of control, shJag1, and shDll1 cells presented with DLL4 on 30 kPa substrates. (C, D) Mean ± 95% CI. Here, we utilized microarrayed patterns of ECM co-presented with Notch ligands to provide a biochemically- and biophysically-defined microenvironment for liver progenitor differentiation. In these patterns, we observed spatially-localized, segregated differentiation of progenitors toward biliary fates peripherally and hepatocytic fates centrally. Other groups have made similar observations using both 2D and 3D engineered systems as part of studies investigating the differentiation of mesenchymal and induced pluripotent stem cells (Ruiz and Chen, 2008; Kilian et al., 2010; Ma et al., 2015; Lee et al., 2015). In these other cell types, pathways related to cell contractility (e.g., RhoA, ROCK, RAC1) and cell–cell adaptor proteins (e.g., E-cadherin) were both implicated. We show in this work that cell contractility is a key inducer of biliary fate in liver progenitors and elaborate roles for cell–cell interactions and mechanotransduction pathway activity in addition to established regulation by Notch and TGFβ signaling. We have previously examined the role of substrate stiffness in the context of TGFβ-induced biliary differentiation, finding that progenitor cells cultured on fibronectin are sensitive to stiffness whereas cells cultured on collagen IV differentiated independent of stiffness (Kourouklis et al., 2016). On collagen I patterns, we observed that high substrate stiffness (E∼30kPa) increases peripheral biliary differentiation, Notch family member expression, and responsiveness to cell-extrinsic ligand presentation (Figure 2). In contrast, low substrate stiffness (E∼4kPa) was more supportive of hepatocytic fate, particularly in the pattern center (Figure 1 and Figure 2). These findings are consistent with other recent efforts toward delineating the impact of substrate stiffness on hepatocyte function, which have identified potential mechanisms of transcriptional and epigenetic repression of HNF4A in hepatocytes experiencing increased cytoskeletal tension (Desai et al., 2016; Cozzolino et al., 2016). By integrating TFM with the array platform, we were able to localize traction stresses and associated cell contractility to the pattern periphery, coincident with biliary differentiation (Figure 4). Paradoxically, treatment with inhibitors of actomyosin contractility (blebbistatin and Y-27632) resulted in divergent fate trajectories. Blebbistatin, a direct inhibitor of myosin ATPase, reduced both peripheral traction stress and downstream biliary differentiation as expected, whereas Y-27632, an inhibitor of myosin light chain phosphorylation by ROCK, increased peripheral differentiation and extension of differentiation centrally (Figure 5 and Figure 6). It is possible this divergence is due to the antagonism of ROCK against RAC1-induced adherens-junction formation (Wildenberg et al., 2006), suggesting that increased cell–cell interactions in the context of reduced cytoskeletal tension is supportive of biliary fate. Further evidence for this hypothesis is our observation of uniform induction of biliary fate by DLL4 presentation in cells with adherens junctions inhibited by DECMA (Figure 3), results which raise the additional possibility that Notch ligand–receptor binding is dependent on adherens junction formation. Lowell et al. provide evidence of such a mechanism in human keratinocytes, observing mutual exclusion of E-cadherin and Delta ligand and further noting that ligand expression promotes cell–cell interactions independent of adherens junction formation (Lowell et al., 2000). Interestingly, treatment with an inhibitor of TGFβ (SB-431542) reduced biliary differentiation and increased hepatocytic differentiation but failed to abolish peripheral expression of Jag1 and Notch2 (Figure 3). It is therefore not likely that TGFβ signaling is the single factor responsible for peripheral biliary fate and associated gradient formation, though it may act through autocrine or paracrine regulation to enable differentiation by other mechanisms. For instance, Zavadil et al. showed that TGFβ serves as a leading signal in the biphasic activation of HEY1 via interactions with SMAD3 and SMAD4 transcriptional regulators, whereas the lagging signal consisted of sustained HEY1-mediated activation of JAG1 signaling dependent on ERK (Zavadil et al., 2004). In the context of liver progenitor fate, this model would require only moderate amounts of autocrine TGFβ to activate the Notch transcriptional machinery leading to ligand expression and associated biliary differentiation. In support of this model, inhibition of ERK signaling with FR180204 reduced both biliary differentiation and peripheral expression of Jag1 and Notch2 (Figure 6). Last, our observation of peripherally-expressed cytoplasmic YAP (Figure 6) is intriguing in light of recent literature regarding the role of YAP as a mechanosensor (Dupont et al., 2011) and regulator of liver cell fate (Yimlamai et al., 2014; Lee et al., 2016) and might serve as a mechanistic effector downstream of peripherally-induced cytoskeletal tension in progenitor cells. Our observations of peripherally-expressed Jag1, Dll1, and Notch2 (Figure 2) are especially striking in light of the TFM data showing colocalization with peak traction stresses. Although we have demonstrated dependence of peripheral expression of ligand and receptor on substrate stiffness and ERK signaling, the exact mechanism linking traction stress to Notch ligand and receptor expression remains unidentified. Answering this question is crucial in order to define the role of cytoskeletal stress relative to Notch and TGFβ in biliary differentiation of liver progenitors. TFM of progenitor cells treated with GSI places generation of traction stresses prior to Notch-mediated biliary differentiation (Figure 4—figure supplement 1). In contrast, TFM of cells treated with SB-431542 provides evidence that TGFβ is upstream of traction stress (Figure 4—figure supplement 2), in accordance with the biphasic model described above in which TGFβ serves as an initial stimulus to Notch activity as well as potential feed-forward induction of cell contractility by TGFβ under conditions of mechanical stress (Tomasek et al., 2002). Recent descriptions of new modes of non-canonical Notch signaling provide other potential mechanisms linking cytoskeletal stress and Notch through ligand–intermediate filament interactions (Antfolk et al., 2017) or Notch transmembrane domain-mediated activation of RAC1 signaling (Polacheck et al., 2017). To gain insight into how cell mechanical stress may influence the Notch pathway, we explored the utility of incorporating mechanical stress into a multicellular model of Notch pathway dynamics (Figure 5). The results of this integrated model demonstrate that the introduction of mechanical stress as a positive regulator of Notch receptor and Notch ligand expression is sufficient to generate a patterning response with enhanced peripheral Notch activation. Notably from the in situ hybridization experiments, the presence of the Notch ligand DLL4 in the arrayed domains appeared to enhance central expression of Jag1 and Notch2 mRNA on 30 kPa but not 4 kPa substrates (Figure 2). This observation would suggest that DLL4 is acting to enhance Notch signaling centrally on 30 kPa. However, cells presented with DLL4 on 30 kPa substrates exhibited preferential biliary differentiation at the periphery with minimal biliary differentiation centrally, indicating that central expression of Notch pathway components may not be sufficient for biliary differentiation. Taken together, these findings suggest that the spatial distribution of mechanical stress signals may impact cell differentiation not only by influencing the expression of Notch pathway members but also through interactions with downstream Notch-mediated transcription or through cooperation with TGFβ and ERK, which is required for differentiation. Furthermore, future experiments incorporating additional quantitative measurements of spatial mRNA expression will be useful in identifying subtler patterns of Notch ligand and receptor expression. 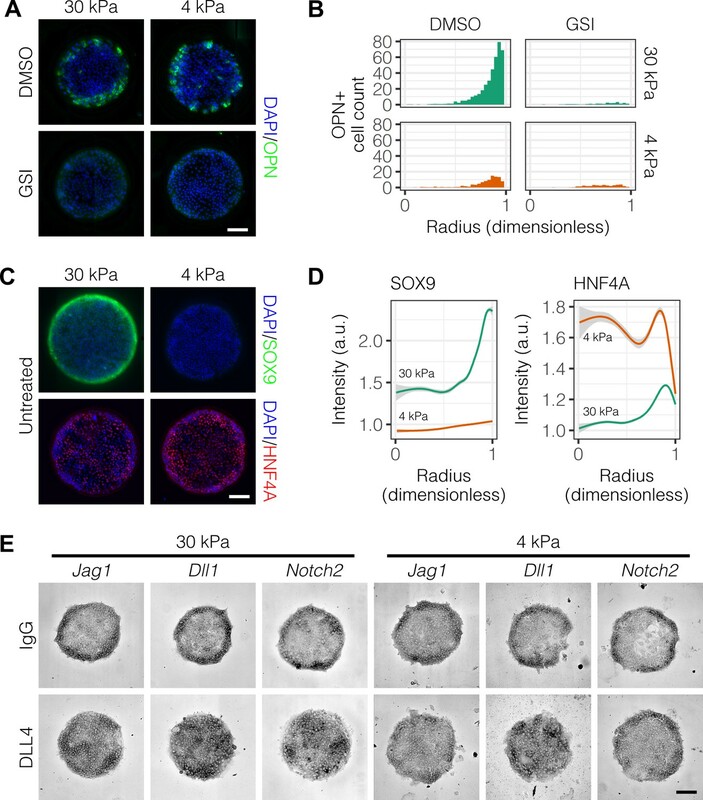 Knockdown of cell-intrinsic Jag1 and Dll1 further revealed distinct roles in both biliary and hepatocytic differentiation of progenitor cells (Figure 7). The reduction of central HNF4A with knockdown of either ligand is particularly interesting and suggests a role for cell–cell interactions with ligand-presenting cells in hepatocytic differentiation. The loss of biliary differentiation with Jag1 knockdown is consistent with the known role of Jag1 expressed in the mesenchyme of the portal vein (Hofmann et al., 2010). 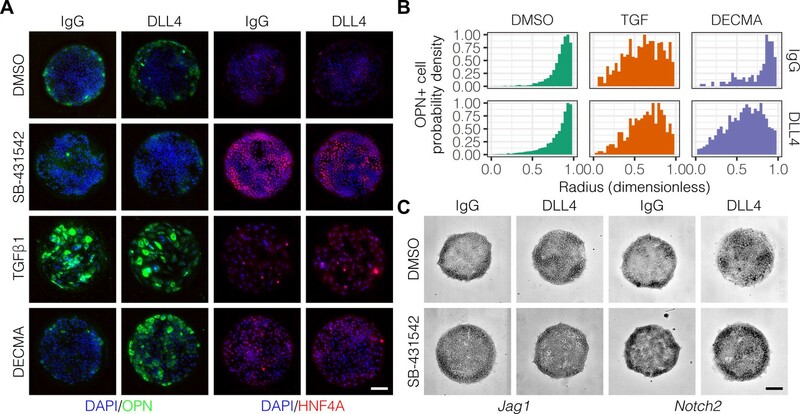 The unanticipated increase in OPN+ cells as a consequence of Dll1 knockdown, however, has fewer precedents and suggests an cell-intrinsic inhibitory role in contrast with that of Jag1. Although we used multiple Notch ligands (DLL1, DLL4, JAG1) in arrays, we have largely focused on presentation of DLL4 to progenitor cells due to its consistent activation of progenitor cells. The differential cell-extrinsic activity of the ligands might be explained in part by the known preferential affinity of ligands for specific receptors (Yamamoto et al., 2012; Andrawes et al., 2013) as well as recent evidence showing that DLL4 binds Notch receptors with greater affinity and requires less mechanical tension to activate signaling (Luca et al., 2017). It may also be a consequence of ligand presentation in the array format, which is known to be a function of molecular weight and charge (Flaim et al., 2005; Reticker-Flynn et al., 2012). 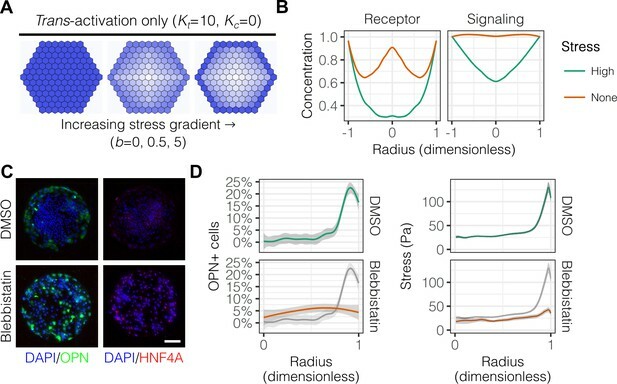 Despite the previously established role of substrate stiffness in hepatocellular differentiation, one of the unexpected observations of these studies was the significant cooperative effect that substrate stiffness exhibited with multicellular geometry. Although substrate stiffness did not substantially influence mechanical stress profiles as measured by TFM (Figure 4), substrate stiffness altered the baseline levels of hepatocyte and biliary markers, with stiffer substrates promoting biliary differentiation and reducing hepatocyte differentiation (Figure 2). Overall, this observation highlights the importance of considering tissue stiffness as a potential variable within current and future studies examining other regulatory signals, such as Notch. In addition, future studies could examine a broader range of geometries, including non-circular. Our analysis of different pattern sizes suggested that peripheral differentiation was independent of diameter (Figure 1—figure supplement 3). As a result, with decreasing diameter, a greater fraction of the cells are at the periphery and exhibit biliary differentiation. Subsequent studies could be aimed at further reducing pattern size or even patterning single cells to determine if there is a size that balances mechanical stress and other intercellular signals for achieving optimal biliary differentiation. Although the array patterns we used represent a relatively simple 2D geometry, we anticipate that the mechanisms regulating progenitor differentiation investigated here will serve as a foundation for future efforts employing 3D culture models while also helping to identify candidates for future manipulation in vivo. Interestingly, during liver development, biliary differentiation is initiated as a ductal plate consisting of a layer of differentiating progenitor cells that encircle the portal vein (Ober and Lemaigre, 2018). Based on our findings related to the spatial patterning of progenitor differentiation, it is reasonable to hypothesize that the structure of the portal vein may play a role in defining the geometric and mechanical cues presented to the nascent biliary cells. In these studies, we utilized BMEL cells, which are untransformed and have been demonstrated to exhibit bipotential differentiation both in vitro and in vivo (Strick-Marchand and Weiss, 2002; Strick-Marchand et al., 2004). Accordingly, they represent a robust model cell type for controlled in vitro studies investigating microenvironmental regulation of progenitor fate specification. Building on our findings presented here, the cellular microarray approach could be adapted for investigating the differentiation of immortalized human bipotential cell lines and, ultimately, primary or stem cell-derived human liver progenitors. Finally, the mechanoresponsiveness of liver progenitors has crucial implications not only for development but also disease. Cholangiocytic cells derived from transitional progenitors have been implicated in the pathogenesis of cholangiopathies, cholangiocarcinomas, and related disorders through compensatory ductular reactions (Gouw et al., 2011) and are further thought to play a role in regenerating the liver by transdifferentiation (Boulter et al., 2012; He et al., 2014; Raven et al., 2017). The mechanisms we describe here may contribute to early sensing of and differentiation responses to the stiff, fibrotic microenvironments in both ductular reactions and regeneration, contributing to the biliary fates observed in these contexts. We utilized BMEL 9A1 cells between passages 30 and 36. These cells were cultured as previously described (Strick-Marchand and Weiss, 2002). Briefly, cells were seeded on tissue culture plastic coated with collagen I (0.5 mg/ml) and subsequently cultured under controlled environmental conditions (37°C and 5% CO2). Treatment with trypsin-EDTA (0.25% v/v) for ≤10 min was used to detach cells for subculturing. Basal media for expansion consisted of RPMI 1640 with fetal bovine serum (10% v/v, FBS), penicillin/streptomycin (1% v/v, P/S), L-glutamine (1% v/v), human recombinant insulin (10 µg/ml, Life Technologies, 12585–014), IGF-2 (30 ng/ml, PeproTech, 100–12), and EGF (50 ng/ml, PeproTech, AF-100–15). Differentiation media consisted of Advanced RPMI 1640 (Life Technologies, 12633–012) with FBS (2% v/v), P/S (0.5% v/v), L-glutamine (1% v/v), and minimum non-essential amino acids (1% v/v, Life Technologies, 11140–050). BMEL cells tested negative for Mycoplasma spp. using the MycoProbe Mycoplasma Detection Kit (R&D Systems, #CUL001B). We confirmed expression of liver-specific genes and proteins in bulk cultures using PCR, immunocytochemistry, and western blot as previously described (Strick-Marchand and Weiss, 2002; Kaylan et al., 2016; Kourouklis et al., 2016). Additionally, bipotential differentiation capacity of BMEL cells was confirmed using bulk cultures within standard tissue culture plates with or without treatment with TGFβ1 (Kaylan et al., 2016; Kourouklis et al., 2016). During microarray-based differentiation experiments, cells were seeded on arrays at 1E6 cells/slide (immunocytochemistry) and 500E3 cells/dish (TFM). Cells were allowed to adhere to arrays for 2 hr before addition before 2× washes with differentiation media and subsequent addition of experiment-specific treatments. All growth factors and drugs used in these experiments were prepared and reconstituted according to the instructions of the manufacturers; see Table 1. The control, shJag1, and shDll1 cells were generated by lentiviral transduction with shRNA constructs targeting a non-mammalian sequence, Jag1, and Dll1, respectively, the details and validation of which we have described elsewhere (Kaylan et al., 2016). List of growth factors and drugs. Polyacrylamide (PA) hydrogels were prepared following previous protocols (Aratyn-Schaus et al., 2010; Tse and Engler, 2010; Wen et al., 2014). Briefly, 25×75 mm glass microscope slides were washed with 0.25% v/v Triton X-100 in dH2O and placed on an orbital shaker for 30 min. After rinsing with dH2O, slides were immersed in acetone and placed on the shaker for 30 min. The acetone wash was followed by immersion in methanol and another 30 min on the shaker. The slides were then washed with 0.2 N NaOH for 1 hr, rinsed with dH2O, air-dried, and placed on a hot plate at 110°C until dry. For silanization, the cleaned slides were immersed in 2% v/v 3-(trimethoxysilyl)propyl methacrylate in ethanol and placed on the shaker for 30 min. The silanized slides were washed with ethanol on the shaker for 5 min, air-dried, and again placed on the hot plate at 110°C until dry. For fabrication of hydrogels with specific elastic moduli, two prepolymer solutions with different acrylamide/bis-acrylamide percentage (w/v) ratios were prepared to achieve elastic moduli of 4 kPa (4% acrylamide, 0.4% bis-acrylamide) and 30 kPa (8% acrylamide, 0.55% bis-acrylamide) with similar porosity (Wen et al., 2014). Each of these prepolymer solutions were mixed with Irgacure 2959 (BASF, Corp.) solution (20% w/v in methanol) at a final volumetric ratio of 9:1 (prepolymer:Irgacure). This working solution was then deposited onto slides (100 µl/slide) and covered with 22×60 mm cover glasses. The sandwiched working solution was transferred to a UV oven and exposed to 365 nm UV A for 10 min (240E3 µJ). After removing the cover glasses, the slides were immersed in dH2O at room temperature for 3 d in order to remove excess reagents from the hydrogel substrates. Before microarray fabrication, hydrogel substrates were thoroughly dehydrated on a hot plate for ≥15 min at 50°C. Microarrays were fabricated as described previously (Flaim et al., 2005; Brafman et al., 2012; Kaylan et al., 2016). Biomolecules for arraying were diluted in 2× growth factor buffer (38% v/v glycerol in 1× phosphate-buffered saline [PBS], 10.55 mg/ml sodium acetate, 3.72 mg/ml EDTA, 10 mg/ml CHAPS) and loaded in a 384-well V-bottom microplate. Collagen I (rat tail, EMD Millipore, 08–115) was prepared at a final concent µg/ml. Fc-recombinant Notch ligand solutions were prepared at a final concentration of 104 µg/ml and included: Fc-JAG1 (R&D Systems, 599-JG-100), Fc-DLL1 (R&D Systems, 5026-DL-050), and Fc-DLL4 (Adipogen, AG-40A-0145-C050). All Notch ligand conditions were pre-conjugated with Protein A/G (Life Technologies, 21186) at a minimum 1:6 molar ratio (A/G:ligand) before arraying. Human IgG (104 µg/ml final, R&D Systems, 1–001-A) was arrayed as a control in experiments involving Notch ligands. A robotic benchtop microarrayer (OmniGrid Micro, Digilab) loaded with SMPC Stealth microarray pins (ArrayIt) was used to transfer biomolecules from source plate to polyacrylamide hydrogel substrate, producing ∼600 µm diameter arrayed domains. For other pattern sizes, we used Xtend pins (LabNEXT) at 200 µm and 700 µm diameter. Fabricated arrays were stored at room temperature and 65% RH overnight and left to dry under ambient conditions in the dark. Prior to cell culture, the arrays were sterilized with 30 min UVC while immersed in 1× PBS supplemented with 1% (v/v) P/S, after which cells were seeded on arrays as described above. Images of entire arrays were converted to individual 8-bit TIFF files per channel (i.e., red, green, blue, and gray) by Fiji (ImageJ version 1.51n) (Schneider et al., 2012; Schindelin et al., 2012). Image size was reduced to ∼50 megapixels/channel by binning to reduce memory requirements during computational analysis. The IdentifyPrimaryObjects and IdentifySecondaryObjects modules of CellProfiler (version 2.2.0) (Kamentsky et al., 2011) were used to identify nuclei for cell counts and regions marked by fluorescence. The MeasureObjectIntensity module was used to quantify single-cell intensity. The location of arrayed conditions within each image was automatically determined relative to manually-located dextran-rhodamine markers. The centroid of each island was calculated and used to assign a radial distance to each cell for analyses of spatial localization within arrayed patterns. Samples were fixed in paraformaldehyde (4% w/v in 1× PBS) for 15 min. Samples intended for labeling of secreted proteins (namely ALB and OPN) were treated with brefeldin A (10 µg/ml, R&D Systems, 1231/5) for 2 hr prior to fixation. Fixed samples were permeabilized with Triton X-100 (0.25% v/v in 1× PBS) for 10 min and incubated in blocking buffer (5% v/v donkey serum and 0.1% v/v Triton X-100 in 1× PBS) for 1 hr at room temperature. We incubated samples for 1 hr at room temperature or overnight at 4°C with one or two of the primary antibodies listed in Table 2 diluted in blocking buffer. The next day, we incubated samples for 1 hr at room temperature with one or two of the following secondary antibodies diluted in blocking buffer: DyLight 488-conjugated donkey anti-rabbit IgG (1/50 from stock, Abcam, ab96919), DyLight 550-conjugated donkey anti-mouse IgG (1/50 from stock, Abcam, ab98767), and DyLight 488-conjugated donkey anti-goat IgG (1/50 from stock, Abcam, ab96935). Samples were mounted in Fluoromount G with DAPI (Southern Biotech, 0100–20) and imaged no earlier than the day after mounting using an Axiovert 200M microscope (Carl Zeiss, Inc.) and associated Zen Pro software. In order to capture entire arrays as one image for later analyses, we utilized the tiling feature of Zen Pro. We performed in situ hybridization as previously-described (Biehl and Raetzman, 2015; Aujla et al., 2015). Samples were fixed in paraformaldehyde (4% w/v in 1× PBS) for 10 min, permeabilized with 0.3% Triton X-100 in 1× PBS for 15 min, and digested with Proteinase K (0.1 µg/ml) for 15 min at 37°C. Afterwards, samples were acetylated, pre-hybridized, and incubated in hybridization solution with linearized, digoxigenin-labeled probes for Jag1, Dll1, or Notch2 at 55°C. Prior to initiation of hybridization, probes were denatured for 3 min at 95°C. After overnight incubation, samples were washed in 50% 0.5× formamide solution and 0.5× sodium citrate and subsequently blocked (10% heat-inactivated sheep serum, 2% bovine serum albumin and 0.1% Triton X-100 in tris-buffered saline). Following blocking, slides were incubated with anti-digoxigenin antibody (see Table 2) diluted in blocking buffer for 1 hr. Next, samples were washed with tris-buffered saline of increasing alkalinity (pH = 7.5, 9.5) and incubated overnight in NBT/BCIP developing solution (Roche, 11 681 451 001). Samples were subsequently fixed with paraformaldehyde (4% w/v in 1× PBS for 10 min), mounted in Fluoromount G with DAPI (Southern Biotech, 0100–20), and imaged similarly to the immunofluorescently-labeled samples described above. For TFM experiments, we adjusted our protocol in order to fabricate the PA hydrogels in glass-bottom 35 mm Petri dishes (Cell E&G, GBD00002-200) rather than on 25×75 mm microscope slides. This enabled us to perform TFM on live cells at 37°C and 5% CO2. To measure the cell-generated forces, we added 1 µm far-red fluorescent beads (0.2% v/v, Life Technologies, F-8816) to the working solution (Wang and Lin, 2007; Wang et al., 2002) and fabricated hydrogels with embedded beads by exposure to 365 nm UV A for 10 min. We subsequently completed the hydrogel and array fabrication protocols as described above and seeded cells on the arrays. After completion of experiment-specific treatments, the arrays were transferred to an incubated (37°C and 5% CO2) Axiovert 200M microscope (Carl Zeiss, Inc.). The microscope was used to capture phase contrast and far-red fluorescent micrographs to record cellular position and morphology along with bead displacement before and after cell dissociation with sodium dodecyl sulfate (1% v/v in 1× PBS). For analysis, we calculated the traction fields from the displacements using standard methods (Butler et al., 2002; Wang et al., 2002) which we have adapted for analysis of cell microarrays elsewhere (Kaylan et al., 2017). We next analyzed the captured images in MATLAB software (MathWorks, Inc) using Bio-Formats (Linkert et al., 2010) in conjunction with a set of custom scripts (see Source code 1–7). Specifically, the border of each island was identified, allowing calculation of a best fit ellipse and centroid. A previously-described digital image correlation program was used to calculate the displacement field between the contracted and relaxed state (Bar-Kochba et al., 2015). Cell island contraction was simulated using COMSOL Multiphysics software (COMSOL Inc., Burlington, MA) as already described (Nelson et al., 2005) using previously-determined parameter values (Sato et al., 1990; Folkman and Moscona, 1978). Briefly, the model was comprised of an active layer bound to a passive substrate with fixed lower boundary. The cell island (20 µm height, 600 µm diameter) was modeled as an isotropic linearly-elastic material with Young’s modulus of 1.5 kPa, Poisson’s ratio of 0.48, thermal conductivity of 10 Wm-1K-1, and coefficient of expansion of 0.05 K-1. The substrate was modeled as an isotropic linearly-elastic material with Young’s modulus of 30 kPa and Poisson’s ratio of 0.48. Contraction was induced in the model by reducing the temperature by 5 K (see Source code 8). Where N is Notch receptor concentration, D is Delta ligand concentration, R is repressor concentration, σ is the stress gradient function, Kc is the constant representing strength of cis-interactions, Kt is the constant representing strength of trans-interactions, b is the base constant for steepness of the stress gradient, α is the maximal production rate, γ is the maximal degradation rate, h is the cooperativity of Delta inhibition, m is the cooperativity of repressor activation, and θ is the Hill coefficient. Subscript i indicates index within the hexagonal lattice while angle brackets denote ensemble value of neighbers of cell i. These equations were evaluated with and without the stress function (σ) under various strengths of cis- and trans-interactions. The model defines σ to be a linear function of the radius of the island, thereby increasing expression of Notch ligand and receptor with radius in accordance with our mRNA in situ hybridization data (see Source code 9–11). Array experiments consisted of at least three biological replicates with 18 total islands per combination of arrayed condition, treatment, cell type, and readout. Counts of cells positive for immunolabels are plotted as mean values representative of an individual island. Line plots of both percentages of positive cells and mechanical stress were calculated using local polynomial regression fitting and are shown with 95% CI ribbons in gray to allow for direct statistical comparisons, that is P<0.05 if the 95% CI ribbons for two conditions do not overlap. The percentage of cells positive for an immunolabel (namely ALB and OPN) was calculated relative to cell counts in each of 30 radial bins across every island. Multiple regression analyses were performed in R using the base lm() function (R Core Team, 2017, R Foundation for Statistical Computing) and are presented as coefficient estimates (β) and associated 95% CI. All β coefficients in regressions represent mean changes in cell counts, for which positive β represents increased cell counts and negative β represents decreased cell counts. For each regression model, we confirmed homoscedasticity, normal distribution of residuals, and the absence of leveraged outliers using residual-fit, Q-Q, and scale-location plots. For select comparisons in the text, Welch’s two-sample t-test was performed in R using the base t.test function. For all hypothesis testing, P<0.05 was considered significant and P-values below P=0.001 are denotated as P<0.001. Journal of Biological Chemistry 288:25477–25489. Journal of Visualized Experiments, 10.3791/2173, 21178972. American Journal of Physiology-Cell Physiology 282:C595–C605. Biochemical and Biophysical Research Communications 466:221–225. American Journal of Physiology-Gastrointestinal and Liver Physiology 313:G102–G116. 285–310, Modeling Notch Signaling: A Practical Tutorial, Methods in Molecular Biology, New York, Springer. Journal of Clinical Investigation 125:2445–2457. Journal of Visualized Experiments 121:e55362. Best Practice & Research Clinical Gastroenterology 25:195–206. ACS Biomaterials Science & Engineering 1:218–226. The American Journal of Human Genetics 79:169–173. Journal of Biomechanical Engineering 112:263. Nature Reviews Molecular Cell Biology 3:349–363. 10161–10216, Preparation of Hydrogel Substrates with Tunable Mechanical Properties, Current Protocols in Cell Biology, John Wiley & Sons, Inc.
American Journal of Physiology-Cell Physiology 282:C606–C616. Biomechanics and Modeling in Mechanobiology 6:361–371. Thank you for submitting your article "Spatial patterning of liver progenitor cell differentiation mediated by cellular contractility and Notch signaling" for consideration by eLife. Your article has been reviewed by two peer reviewers, and the evaluation has been overseen by a Reviewing Editor and Didier Stainier as the Senior Editor. The reviewers have opted to remain anonymous. The paper describes a compelling intersection between chemical and mechanical cues (Notch and TGFB signaling; cytoskeletal tension) during biliary specification, using an elegant interdisciplinary approach (computational tools, small molecule perturbation, biophysical measurements). To experimentally probe the role of mechanotransduction pathways, inhibitors of ERK and ROCK were used, as well as imaging of YAP localization. Notch ligands Jag1 and Dll1 were knocked down, which unexpectedly resulted in decreased hepatocyte differentiation. Based on these results, the authors assert that the Notch, TGFb and mechanical signals are involved in biliary differentiation. 1) Additional discussion is suggested to more directly establish the biological relevance of the experimental system (2D cell patterns vs. the complex 3D context of the developing liver). In line with this, the authors should comment on how predictably the gradients of soluble factors and the substrate stiffness affect the cell differentiation outcomes in their model, and how representative are the BMEL cells for primary human cells. Also, the role of the computational model is not clear, as it does not result in mechanistic insights, and its accuracy is uncertain. 2) Data were obtained for circular micropatterns 600 µm in diameter. Rationale for choosing this diameter, an analysis of the effects of pattern size on cell differentiation and a prediction of the maximum pattern size for pure cholangiocyte differentiation would be instructive. 3) Given the breadth of previous publications of the authors, additional commentary and analysis of the cell plating density and motility would help distinguish the current work. In particular, it should be explained what is the role of cell density on differentiation segmentation, and if there is a critical density for cell differentiation on the edges. 4) Some clarifications of the experimental data are suggested. - For Figure 1D-F, the authors should clarify the ligand they used, consider moving the regression analysis from the supplement into the main figure (to replace the CK19 data), and explain why Alb+ cells were more prominent at R~0.5 rather than R=0. - In Figure 2E, the authors show that Notch ligands are distributed at the periphery and this effect is disrupted by Dll4 presentation on stiff gels but not soft gels. It is not clear how the disruption of this distribution would enhance periphery differentiation. - In Figure 3C, Dll1 should be included. Additionally, the statement "SB-431542 treatment reduced central induction of both Jag1 and Notch 2 by presentation with DLL4" should be explained. 5) To validate the claim that YAP plays a role in progenitor segmentation, the authors should try to quantify cytoplasmic YAP localization on soft (~ 4 kPa) substrates. We thank the reviewers for these helpful critiques. Throughout the text, we have expanded the description of our rationale and justification for using the BMEL cells and arrayed 2D geometries, as well as a further discussion of how our results compare to initial predictions and previously established mechanisms. In addition, we have expanded our discussion of the included computational model, specifically highlighting the insights that this model, and models like it, could provide. We have included a set of studies that specifically examine the effect of pattern diameter (new Figure 1—figure supplement 3). These findings demonstrated that OPN expression, indicative of biliary differentiation, remained confined to the periphery independent of pattern size. In addition to this new supplemental figure, an expanded discussion of these results and the potential influence of pattern diameter is included in the text. We agree that a further discussion of cell density and motility was warranted. We have added a new supplementary figure (Figure 1—figure supplement 2), which addresses these aspects. Specifically, we have included analysis of OPN and CK19 expression at an early time point (t = 24 h) that demonstrates that peripheral expression of these markers occurs very early following differentiation induction, suggesting that it is unlikely to be dependent on cell motility. Further, we quantified cell density across the patterned cellular islands. This quantification of cell density indicated uniform density with radius, ruling out condensation as the main mechanism of differentiation in this context. We have clarified the legends for Figure 1D as well as what was previously Figure 1E–F (now Figure 1—figure supplement 1) by stating the ligand used in each subfigure. Specifically, we presented DLL4 in Figure 1D and IgG for the CK19 data now shown in Figure 1—figure supplement 1. We agree with the reviewers regarding the placement of the regression analysis of the OPN+ and ALB+ cell count data in Figure 1B–C. This regression analysis has therefore been moved to Figure 1E–F. As for why ALB+ cells peak at R~0.5, this is a consequence of a reduction in ALB+ cells at the periphery with ligand presentation. In contrast, cells presented with IgG exhibit a monotonic distribution without reduction at the periphery (see the first panel on the left in Figure 1C). Although there is a visible reduction in ALB+ cells at the periphery in fluorescence images (see ALB row in Figure 1A), our linear regression analysis indicates that this reduction in peripheral ALB+ cells is only marginally significant (Figure 1F). We therefore chose not to discuss this specific result in detail. The reviewers are correct that the distribution of Notch ligands is altered by the presence of DLL4 on the 30 kPa substrates. This is due to a central induction of Notch ligands on the 30 kPa substrates. However, on 4 kPa substrates, DLL4 does not similarly induce this increase of Notch ligand expression in the central region. Collectively, these observations imply that increasing substrate stiffness can induce further responsiveness to ligand presentation as measured by Jag1 and Notch2. We believe this finding provides further support for our hypothesis that a biomechanical signal, such as substrate stiffness, can modulate Notch signaling in the context of liver progenitor differentiation. In regard to the resultant effect on peripheral differentiation, we hypothesize that the spatial distribution of mechanical stress signals may impact cell differentiation by not only influencing expression of Notch ligands/receptors but also by interacting with downstream Notch-mediated transcription or other cooperative pathways such as TGFβ and ERK signaling. Accordingly, despite an elevated level of Notch ligands/receptors centrally in islands on 30 kPa presented with DLL4, cell mechanical stress is still concentrated at the periphery of the islands resulting in peripheral progenitor biliary differentiation. We have added further clarification and discussion of these points to the Results and Discussion sections. The purpose of this experiment is to determine whether TGFβ signaling impacts the formation of the gradient of Jag1 and Notch2 mRNA expression. The results indicate that TGFβ signaling is not required for gradient formation but nonetheless modulates the responsiveness of central cells to presentation with DLL4. This modulation of responsiveness is consistent with our prior work in liver progenitors demonstrating that TGFβ induces expression of both Notch ligand and receptor (Kaylan et al., 2016), both of which we show is important for fate segregation within patterns elsewhere in the manuscript. Throughout Figure 3, we included DLL4 as the representative Notch ligand, because it consistently induced a robust baseline pattern of differentiation for modulation with the various inhibitors in these experiments. We agree that in order to evaluate the potential role of YAP, a more thorough and quantitative analysis of YAP expression was required, beyond our original qualitative description. Accordingly, we quantitatively examined the expression of YAP in the arrayed islands and now have reported this spatial quantification for both 4 kPa and 30 kPa substrates in Figure 6E. Notably, consistent with biliary differentiation markers and Notch ligands/receptors, YAP exhibited an increased expression at the periphery of these cell patterns. Peripheral expression of YAP was observed for both 4 kPa and 30 kPa substrates (Figure 6E), but this pattern of YAP expression was not influenced by the presence of Notch ligands in the array domains (data not shown). The funders had no role in study design, data collection and interpretation, or the decision to submit the work for publication. The content is solely the responsibility of the authors and does not necessarily represent the official views of the National Institutes of Health. The authors gratefully acknowledge Hélène Strick-Marchand and Mary C Weiss (Institut Pasteur) for providing BMEL cells. We would also like to thank Dianwen Zhang (Imaging Technology Group, Beckman Institute) for assistance with microarray imaging and Karen Weis (Molecular Physiology, University of Illinois at Urbana–Champaign) for advice and materials. © 2018, Kaylan et al.